An ex-evangelical turned Catholic priest named Dwight Longenecker has, in his current religious incarnation, become a fan of ritual and symbolism. Hmm, let me think: Could I be one of Mr. Longenecker’s heavily conditioned, typical evangelicals? Possibly. I’m not keen on being known as ‘Christian plus a Bunch of Adjectives’, whether they be relatively innocent terms like “evangelical”, “dispensational”, “premillennial” or whatever. But if we take the word “evangelical” simply to mean that I believe in the Great Commission, so called, well, I suppose you had better include me in that bunch. Leaving aside the obvious straw-manning of his claim that typical evangelicals dismiss all symbolism and liturgical components of religion as useless, distracting, man-made and traditional, and regardless of whether I am “heavily conditioned”, I agree with Mr. Longenecker that there’s considerable disagreement within Christendom about the role of “physical components” of religion. First, Mr. Longenecker and I would undoubtedly agree that certain physical objects in the church are not useless. The bread and the wine, for instance, are physical objects of which we partake and by which we remember the Lord, as he commanded. Certain physical objects make good reminders. That’s far from useless, since we have a tendency to easily forget. Second, far from being a distraction, a physical object may well focus the mind quite effectively. I have often been in worship meetings where different believers take part. Some of these believers are more spiritually mature than others and have greater familiarity with scripture. Occasionally one of the less mature Christians wanders off into personal anecdotes or bizarre analogies inappropriate to the occasion. But when reminded it is time to break bread and share a cup, the introduction of these physical objects more often than not actually serves to focus the concentration of the congregation, rather than to distract it. We often came right back to the subject of Christ himself, which is where we should be. So nobody can argue that the symbols of “this bread” and “this cup” originated with man. Yet they are indisputably physical aids to worship. If evangelicals object to physical objects, it is to objects that originate in the fantasies of man rather than in the commands of God. In which case, their criticism doesn’t come from “heavy conditioning”, but from simple observation and the use of common sense. So far Mr. Longenecker and I have no reason to disagree. I’m not dismissing his “physical components”, his symbols and even his sacraments. I believe at the root of much of this insistence on the performance of symbolic acts is the failure to observe the role of a symbol in relation to the greater, spiritual reality of which it is only a poor picture at best. And the moment we make a symbol “necessary” rather than merely useful, we have added human effort to the work of Christ as our means of salvation. But symbol is not reality. No symbol can administer salvation. Tithing was a physical act. It required taking a tenth of something out of whatever container, pen or pocket you kept it in, and walking it down the road or across the fields to the temple or synagogue where you would hand it to the priest or his designate in lieu of giving it to God. That was the physical act, the symbol. Tithing, properly observed, was an act of justice in that it was the recognition by a faithful Israelite of an obligation to God brought about by God’s goodness to him in the material sphere. That obligation was just, fair and reasonable. It demanded an appropriate response, which God carefully spelled out to Israel through Moses. Tithing also reminded the godly Israelite that justice should mark every interaction he had with other Israelites and even with those outside the nation. Tithing, properly observed, was an act of mercy in that it provided for the needy. For example, a variant of the tithe involved deliberately failing to harvest every scrap of grain that grew in one’s fields. The gleanings and bits around the edges were to be left for the “poor and the foreigner residing among you”. Doing so was a small symbolic gesture that required the owner of the field to both be merciful and to contemplate God’s mercy to him. Tithing, properly observed, was an act of faithfulness in that it provided for the material needs of the priesthood. It was an act of obedience that ‘kept faith’ with the priests. Without it, the temple service quickly degenerated and was discontinued, as in the time of Nehemiah. In Malachi, God calls failing to bring in the “whole tithe” a form of robbery. So, faithfully observed, a little physical act — a symbol or ritual, if you like — could signify things that were much greater. It spoke to a spiritual reality not visible to those who failed to exercise faith. But it should be evident that the symbol and the thing symbolized are not one and the same. When, for instance, a faithful Israelite deliberately practiced the symbolic act of leaving the edge of his fields for the poor and foreigners, it is quite possible that if he did so in a time of prosperity, nobody would need to take him up on the offer and the only beneficiaries of his generosity would be the birds. The symbol would exist — mercy in principle would have been extended — but no effective act of mercy would be performed even though the symbolic gesture was made in goodwill. And it was very possible to tithe without justice, mercy or faithfulness, as in the practice of corban at the time of Christ, which involved a tithe given to the temple service that was actually stolen from one’s parents. The symbol could easily exist without the spiritual reality it was intended to represent. In saying this, the Lord makes it clear that the symbol is not the thing symbolized. It is only a reminder of that which the Lord says are the “more important matters”. Should the Israelites have bothered continuing to tithe mint, dill and cumin then? Absolutely: “You should have practiced the latter, without neglecting the former,” he says. But it was, in fact, possible to practice the latter (justice, mercy and faithfulness) while neglecting the former, just as it was possible to maintain the symbol in the absence of the spirit that should rightly accompany it. Unlikely, I suspect, but possible. So the symbol and the thing symbolized are very much distinct, and it is the thing symbolized that is most important and of the greatest concern to God. But how do human beings measure the “more important matters of the law”? They are, necessarily, the province of God alone, since they concern the motives of men’s hearts. It’s easier by far to total up quantities of dill and cumin, divide by ten and pat yourself on the back for a job well done, hence the Pharisaical tendency to feel superior because one has offered something tangible and measurable. It’s a whole lot easier to perform a ritual than to live justly, mercifully and faithfully. Here’s another example: Paul tells us, “It is written in the Law of Moses: ‘Do not muzzle an ox while it is treading out the grain.’ ” It’s a little symbolic gesture that happened to be perfectly reasonable and kind at the same time, like so much of the Law: give the poor ox a break and let him have lunch since he’s the one doing the work. But again, a greater spiritual reality is in view. The symbol is not the thing symbolized. Here Paul makes it clear that the thing symbolized is not only MORE important than the symbol, it is MUCH more important: “Is it about oxen that God is concerned?” he asks rhetorically. If it is a matter of weighing the comparative value of the symbol and the thing symbolized, the weight of God’s concern, Paul says, is very much in favor of the latter. One more. When the hungry disciples walked through grain fields on the Sabbath and helped themselves to a few heads of grain to ease their hunger, the legalistic Pharisees complained that they were “breaking” the Sabbath by “working” during it. Jesus told them, “The Sabbath was made for man, not man for the Sabbath”. You can bet the disciples went right on breaking it. The symbol serves the spiritual reality, not the other way round. There are good reasons to retain the symbols and “physical components” of the faith given to us in the New Testament. These are fewer and further between than Mr. Longenecker probably acknowledges. In fact there are precisely two. I hope to consider them in detail in future posts. But the moment we insist that the symbol or act itself is critical to salvation or grace, we have lost the plot. We have made legalism and human works of equal value with the sacrifice of Christ. Because being a Christian means not being under law at all. It means living day by day in a higher reality where the law is written on your heart and earthly symbols never lose their actual proportion in relation to that which they represent; where you observe a higher standard than that which is commanded because love is the motive in everything you do. And mere symbols, rituals or symbolic acts, while they may serve to aid memory and focus the mind, do not save. The symbol is not the point. "And mere symbols, rituals or symbolic acts, while they may serve to aid memory and focus the mind, do not save. The symbol is not the point." Yes and No. If a symbol will not save, will it therefore also not condem? Thus, the symbol may not be the point but it is making a point. E.g. 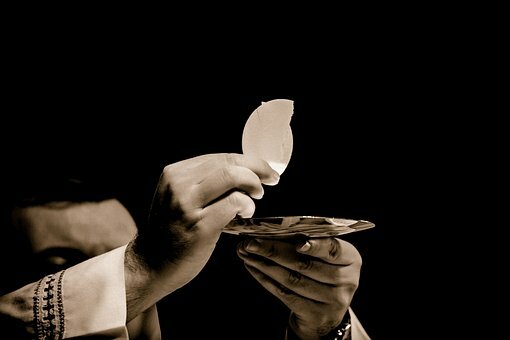 the Eucharist in the Catholic Church implies when received that a communion exists between you and your creator. The governor of NY (Cuomo) just implemented the most barbaric abortion law possible and yet he will, as a Catholic, continue to receive communion. The point made of a union with your creator is obviously lost on him. Now, since God will probably not strike him down immediately it seems clear that ignoring the symbolism (or, in the Catholic Church the reality) of the Eucharist may be detrimental for the governor in the long run and may indeed contribute to his condemnation. So there is more than just a memory aid and focussing your mind involved.